Why pay for store-bought bibs when you can make these kid-friendly terrycloth baby bibs and have fun while you're doing it. They're the perfect item for that baby shower gift or for any new mom. 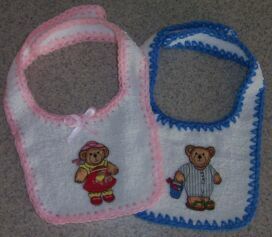 Using the baby bib template, cut out 2 separate bibs from the hand towel. Using an awl (or a similar sharp object) punch holes 3/8" apart all the way around the edge of each blank baby bib. With pink yarn, single crochet in each hole all the way around the girl's bib. Fasten off. Repeat with blue yarn for the boy's bib. For the girl's bib, create a small bow from the pink ribbon and attach it at the top center of the main part of the bib. NOTE: Make certain you sew down the loops and ends of the bow to prevent the bow from being grabbed and pulled off. Or you can simply eliminate the bow entirely. On both the girl's and boy's bib, iron on the appliques you've chosen. If the edge of the applique doesn't adhere well, you can stitch around it as an added precaution. Attach small pieces of velcro to the end of the straps of each bib.